Don't you think colognes should do more than just smell nice? We do too. So we developed our unisex Blueberry cologne to naturally neutralize odors, conditions coats and leave a fragrance that last and lasts. 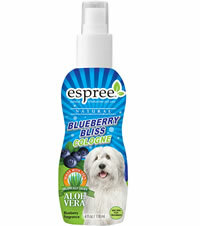 Yum, yum smell of bubbly blueberries!